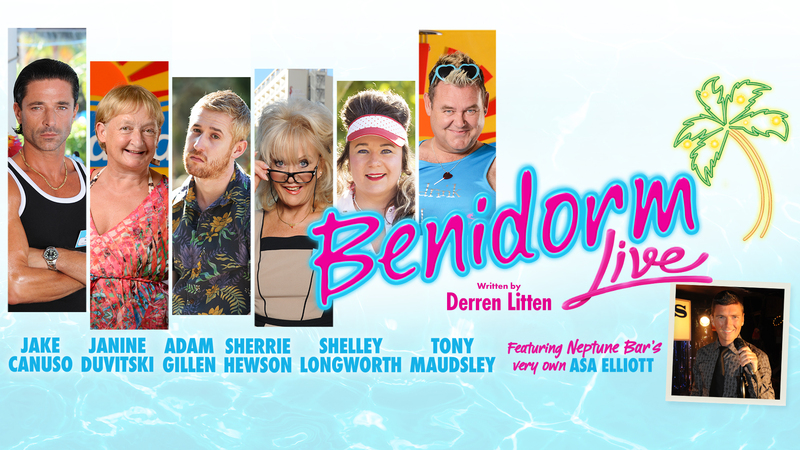 Derren Litten - Benidorm LIVE! Well, it’s happened again, I look at my blog and see that it is months not weeks since I last posted. I suppose I do have a bit of an excuse that I have been very, very busy not least with the latest part in the life of Benidorm, or my version of Benidorm, “the gift that keeps on giving” as my mate Alan always refers to it. A live stage show Benidorm (as opposed to a dead one, although we have enough cast for that version too these days) has been talked about for many years. My agent and I first started talking about a stage tour with a different producer who was very keen but said only an arena tour would be financially viable. I don’t know much about producing theatre shows but I knew this definitely wasn’t the case, I assumed it was financially viable but only if you were willing to lower profits. I’ve never been a great businessman, any writer who had a TV series for 10 seasons would, by about season 4 have started their own production company and demanded a co-production of the show, thus making more money (but a lot more hassle). I’ve always put quality of life above profit; I’m all for making more money but if making that money gives me mucho stress and headache I’d rather just back down to my regular salary – this of course is easy to say when your salary is in 7 figures. So the idea of an arena tour didn’t excite me, who wants to sit in a draughty air craft hanger on a hard plastic seat waiting to watching the live version on a tv show on a LCD screen? Well, quite a few people according to the Mrs Brown’s Boys Live tour but Benidorm is my creation and I wanted the theatrical version of the show to be just that, theatrical. How can you give the actors a time for ‘curtain up’ when there is no curtain to go up? Do people really want to watch comedy wearing a hat and coat? And what’s the point of having a stage door that is practically in another postcode? Call me old fashioned but I like the idea of the audience having a chance of getting their programme signed without the use of an Uber. So we walked away from the idea and left it for a couple of years. More producers threw their hats into the ring but either cast availability didn’t work or the timing just wasn’t right. We also had the original TV version which when you took into consideration the writing, filming and editing, took around 9 months in total – not a great deal of time left over to write and produce a touring stage version. Then, slowly, the planets started to align, my exec producer Paul Jackson (legendary television maker and the man who, 10 years ago, was Director of Entertainment & Comedy at ITV and actually commissioned the first ever series of Benidorm) suggested a meeting with theatre producers Michael Harrison and David Ian. I asked what shows they had produced, the reply was pretty impressive: Gypsy (with Imelda Staunton), Funny Girl, Young Frankenstein, all in the west end and national tours of Grease, The Bodyguard, Sunset Boulevard, Cats and Jersey Boys. OK, sounds pretty impressive, what’s next? This meal at The Ivy had a much more satisfactory ending, we agreed to make Benidorm Live, the stage version of my TV show Benidorm. And now I’ve written it and people have bought tickets (a lot of tickets, if you want to come and see it either buy yours now or at least start saving because it looks like we are gonna sell out), it’s really going to happen! I can’t tell you how excited about the show I am, we have brilliant producers, a fantastic designer and a brilliant director who shares the same theatrical vision for the show and a genuine love of the TV show. And of course we have amazing stars from off the telly, Jake Canuso, Janine Dutvitski, Adam Gillen, Sherrie Hewson, Shelley Longworth, Tony Maudsley plus a full supporting cast. People have been asking me what kind of show it’s going to be, before I wrote it I genuinely didn’t know – through all the years of the many meetings that didn’t work out (one year we even talked about doing a benidorm Pantomime) I didn’t know exactly what form the show take – a musical? A straight play? (Straight? Me?!) A variety type show with a Benidorm theme? In the end I wrote what I know is the best bumper episode of Benidorm I’ve ever written (and I’ve written a few over the years!). It has everything you love in tv show, outrageous comedy, brilliant music, something to make you laugh and maybe even to make you cry. I genuinely can’t wait for you to see it. Oh, and the only way you can see it is to come to a theatre near you (or far from you if you don’t live near a theatre). I specifically had it written in the contract that no DVD of the show would be made (what was I saying about me not being a brilliant businessman?! ), I don’t care about the extra revenue, this is a show that needs to be experienced in the theatre, not in a living room. So roll up, roll up, come along to the show you can afford to see but can’t afford to miss, BENIDORM LIVE!